How It Works is a clear, simple, textbook style app. It visually shows kids how things function and do what they are supposed to do. 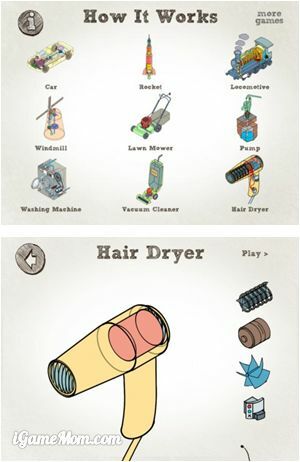 There are 9 items featured in the app: a car, a rocket, a steam engine, a windmill, a lawn mower, a pump, a washing machine, a vacuum cleaner and a hair dryer. The app displays a transparent outline of each of these items as their insides wait in the wings ready to be placed together to make the specific machine work. It’s essentially a puzzle, but for children 4 and over the app introduces basic concepts about how common machines are built and how their working parts come together to create specific motion. Once the puzzle is complete, it can be taken for a mini test run to see all the parts work inside the transparent frame. It is nice that when each part is selected, the name of the part is shown on the lower left corner. However, there is no verbal explanation about the part or how the parts fit together. It leaves space for kids to explore on their own. Or if you’d like, you can explain more in details about each parts and how the parts fits together to do the task the machine is expected to. It could be frustrating for some kids who need explanation of how things work, while it could be perfect for those who are more prone to explore on their own. The transparency of the moving 3D drawings offer a very straight forward showing of the inside of each machine. There is no physics involved to explain how motion is created when coal is added to flames, etc. You’re on your own there. 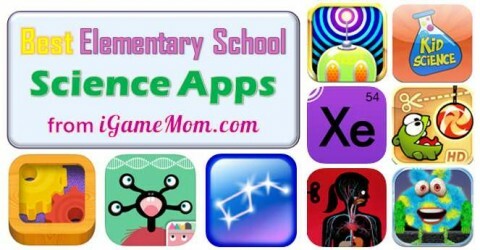 I’m a big fan of using apps with kids and without adult involvement the app probably won’t hold a child’s attention for long, but this makes for a great teaching tool for parents, teachers, or budding tinkerers. How It Works is available on iPhone, iPod and iPad. It is $1.99 on App Store. Next post: App News : Want to make new friends? Meet the Fluffy Monsters app!